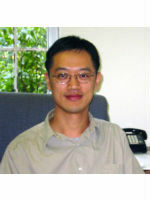 Dr. Weiqun Peng received his Ph.D. at University of Illinois at Urbana Champaign in 2001 for research on statistical physics and soft condensed matter systems. From 2001 to 2004, he did postdoctoral research at the University of California San Diego. He joined the George Washington University in 2004. His research focuses on understanding how things work in the context of biological systems, using both data-driven and modeling approaches. Unique to biological systems is their emergent complexity and self-organization, which is deeply connected to gene regulation. Understanding gene regulation has been a major focus of molecular biology. Genetic information is encoded in the linear sequence of DNA, and despite all cells in the human body having the same genetic information, they each behave quite differently. For example, skin cells and immune cells exhibit dramatically distinct functions and morphologies. This occurs because different types of cells have different sets of genes turned on or off, a feature called epigenetics. How is this achieved? It turns out that potentially stable and heritable information, i.e. epigenetic information, is encoded outside of the primary DNA sequence. Nature has developed a sophisticated system of proteins (“writers”, “erasers” and “readers”) to manipulate this epigenetic information. The epigenetic marks and respective regulators play a critical role in establishing cell identity; their dysregulation is a major hallmark of diseases like cancer. My research aims to understand gene regulation, with a special focus on the epigenetic aspect.